Yes you read that right! iPhone 5 has been jailbroken successfully on the launch day! 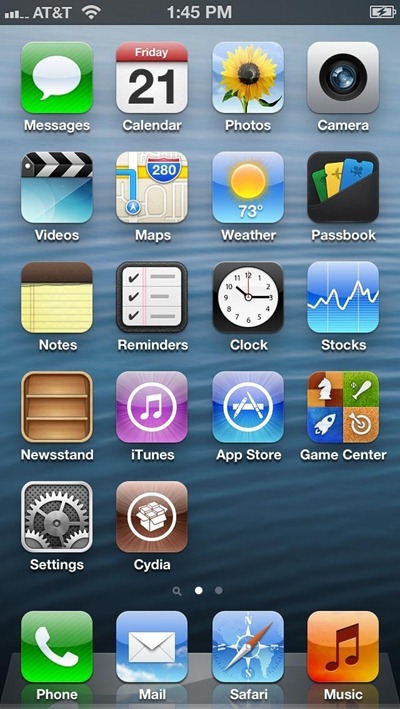 Popular and respected iPhone developer chpwn tweeted a picture of his iPhone 5’s homescreen with Cydia icon on it in full 1136 x 640 resolution glory (the same res. as iPhone 5). Now, I’m sure a few of you – as have on Twitter – will suggest the screenshot is nothing more than a simple bit of Photoshop work, or even a web bookmark decorated to look like the real deal. However, the community in general has grown to respect chpwn (Grant Paul) quite a bit over the years, and he’s definitely got the skills to pull something like this off. It doesn’t look as if it is ready for primetime yet though (the lack of a snap showing the homepage within Cydia), but it’s definitely a start, and we can only welcome such progress as it continues over the coming weeks and months. Last year, it did take a few months for the untethered jailbreak to arrive, and since we’re now dealing with a device packing a brand-new A6 processor, don’t be surprised if it takes even longer this time around for this to land in public. Still, it’s certainly a great first step. And in case you don’t already know, a tethered jailbreak is already available for A4 based devices like the iPhone 4, 3GS and iPod touch 4th-generation running the latest iOS 6. You can find our jailbreak iOS 6 guide here. 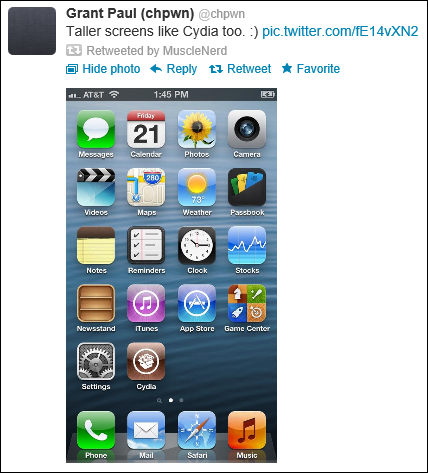 UPDATE: MuscleNerd of iPhone Dev-Team has retweeted chpwn’s tweet about iPhone 5 jailbreak. That says it all. The jailbreak achieved is legit!